BusyCal enables you to share calendars with other iCloud users. Once each user has configured BusyCal to sync with their personal iCloud account, you can share calendars with each other through iCloud. When a calendar is shared through iCloud, events can be edited by any user and changes sync between them. 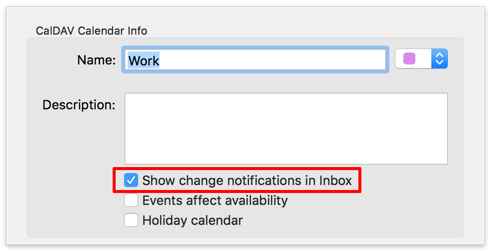 Select the Share calendar checkbox, and then enter the iCloud email address of the person you want to share the calendar with. Select “Allow Write” if you want them to have read-write access to your calendar; otherwise, deselect it to give them read-only access. Click OK. BusyCal begins syncing with iCloud and an icon appears next to the calendar name indicating that it is shared. 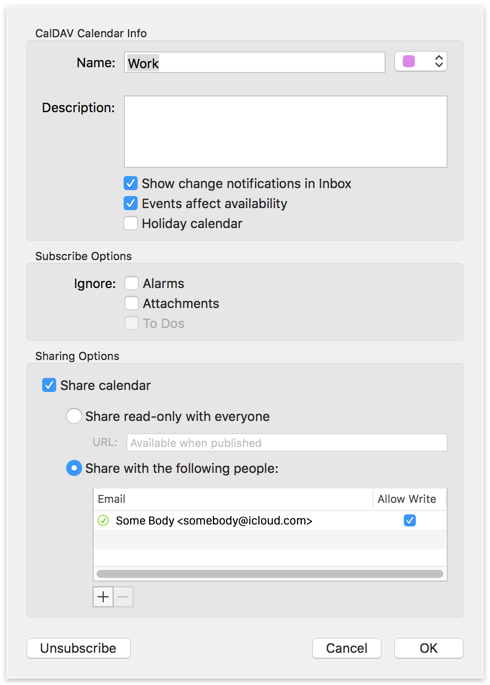 The person you shared the calendar with will receive an email invitation from iCloud. 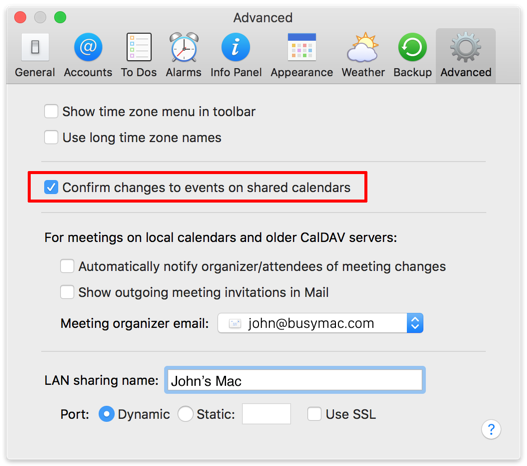 If they are running BusyCal or OS X Calendar and are syncing with iCloud, the shared calendar appears automatically when they accept the invitation. You can also share an iCloud calendar as read-only public calendar, available to anyone who uses an app or web service that accepts webcal URLs. To do so, follow the instructions just above, but in step 2, select “Share read-only with everyone.”After you click OK, reopen the Calendar Info dialog; the public URL appears in the URL field. To copy it to your clipboard, Control-click it and choose Copy from the contextual menu. BusyCal (for both OS X and iOS) and the built-in Calendar app on OS X and iOS are CalDAV clients that sync with iCloud. 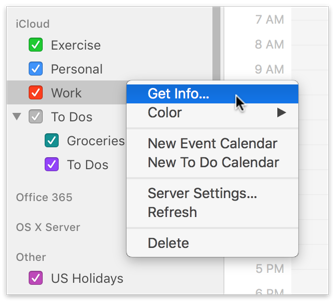 This means any data you enter into the built-in Calendar app on OS X or iOS will sync to BusyCal through iCloud, and vice versa. 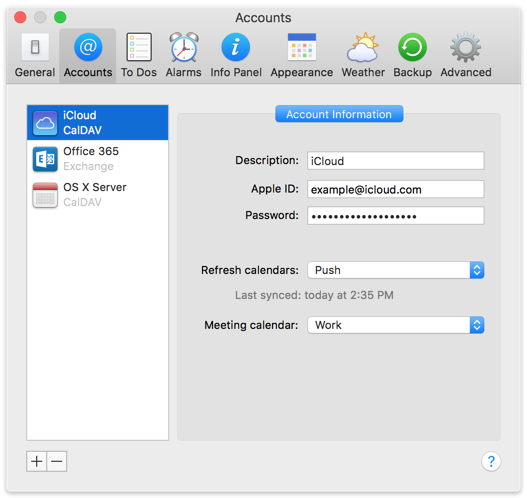 As long as you have all client apps configured to sync with the same iCloud account, all your calendar data remain in sync. All calendars you want to sync between your Macs, iOS devices, and other users must be hosted on iCloud. You cannot sync calendars from other sources (On My Mac, Google, Exchange, etc.) to iCloud. 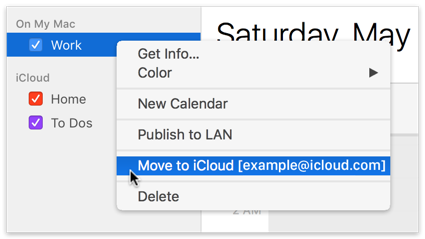 If you have any existing calendars hosted elsewhere that you want to host on iCloud, you can move them to iCloud or merge them with an existing calendar in iCloud, as follows. Make sure you are syncing with iCloud and that your iCloud Account appears in the left sidebar. Control-click the calendar that you want to move to iCloud and choose Move to iCloud from the contextual menu. iCloud requires you to store events and to dos on separate calendars. If the Work calendar contains both events and to dos, it will be transformed into two calendars on iCloud—one for events and one for to dos. The to do calendar will be indicated with a checkmark next to its name. Choose File > Import and select the file you exported in step 1. If the “Import events into” section does not appear at the bottom of the dialog, click Options to display it. 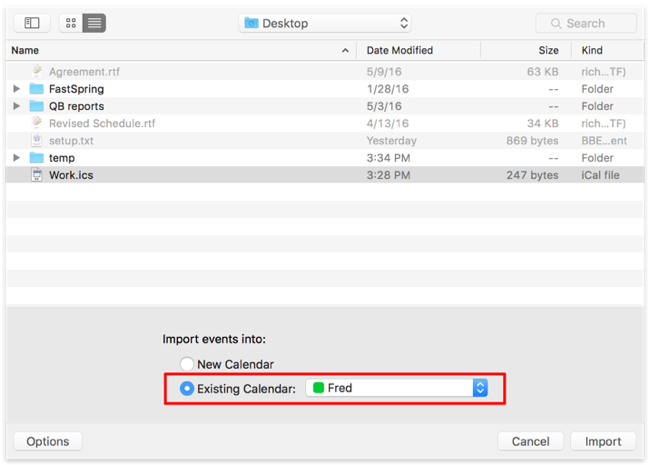 Select Existing Calendar, and choose the Fred calendar (which is hosted on iCloud). BusyCal adds the events from the Work calendar to the Fred calendar on iCloud. Note: iCloud stores events and to dos on separate calendars. Therefore, if you attempt to import a calendar that contains both events and to dos into a calendar on iCloud that only supports events, the to dos will be rejected. 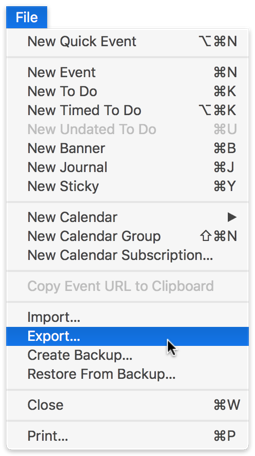 To import the to dos, you must repeat this step and import into an existing calendar on iCloud that supports to dos. BusyCal syncs all its data types (events, to dos, journals, graphics, stickies, attachments, tags, etc.) with iCloud. Stickies, Journals, and Graphics in BusyCal sync between BusyCal clients through iCloud, but appear as all-day events in Calendar and other clients. 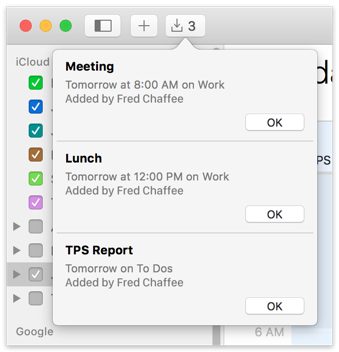 To dos in BusyCal sync with the Reminders app on OS X and iOS through iCloud. They do not appear in Calendar for OS X or iOS.